Looking for something to kick the heat up this Taco Tuesday? Check out my Fire Hot Instant Pot Taco Bowl. Make up homemade taco bowls in just 12-minutes, that packs some heat. Ground turkey, black beans, rice, for a protein packed dish your family will love. The beauty of a taco bowl is there is minimal mess involved. Grab a bowl, spoon in the mix, and then add in all your favorites toppings and devour. No worry about the meat and toppings falling out of the shell or anything like that. Quick, easy, n0-fuss dish that is mighty delicious. 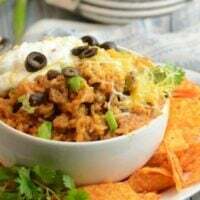 When I make this fire hot Instant Pot taco bowl recipe in our home, there is never a drop left! It is that good! I try and incorporate black beans into our diet in most recipes that will seem to work. Black beans are packed full of protein and great for your heart, digestive system, controlling your blood sugar and more. Plus they really help stretch this dish out so you can serve even more people. These turkey Instant Pot taco bowls are perfect for a busy night of the week, and it’s pretty healthy too. Add your favorite toppings and each member of the family can feel like they got a created just for them. I love to pile mine with lettuce, shredded cheese, sour cream, cut up avocado, and then I am set. My husband eats his plainer with just some lettuce and tomatoes. Having the option to top how you like is the beauty of these fire hot taco bowls. If you like heat but can’t handle too much you can always reach for medium Salsa instead of hot and go with regular taco seasoning. We also serve ours in bowls but this would make the tasty filling to stuff into actual tortilla shells if you would like. For this recipe, I used my 6-qt Instant Pot and it worked perfectly in size. Also if you want you can opt out of the sour cream and use Greek yogurt instead if you prefer. Feel free to use different flavors of cheese as well to fit your liking. This is just what our family loves, but it can be tweaked and still turns out beautiful. Quick, easy, no-fuss dish that is mighty delicious. 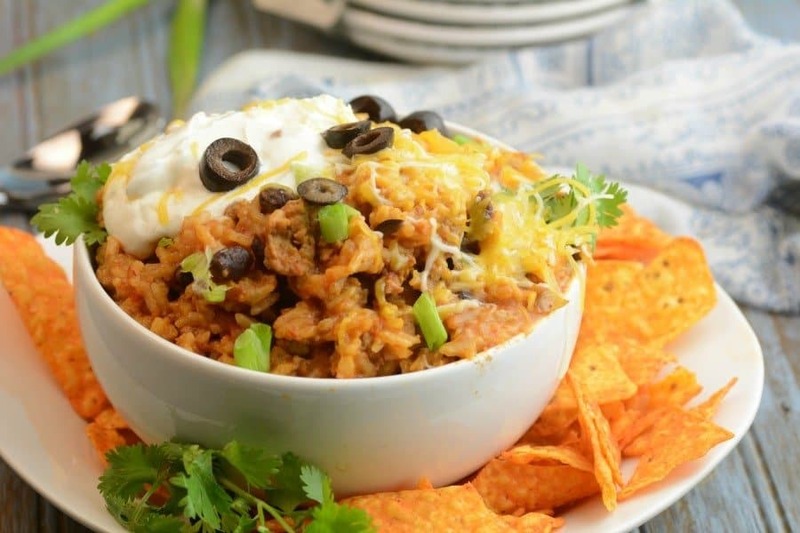 When I make this fire hot Instant Pot taco bowl recipe in our home, there is never a drop left! It is that good! Directions: Place your pot on saute. Saute ground beef or turkey until brown. Add 2 packets of taco seasons and water. Add beans and rice. Add salsa last on top. Place on your rice setting or on manual low pressure for 12 minutes. Do a quick release and Add cheese stir until melted. Garnish with sour cream, green onion, and black olives. Serve with nacho chips. Enjoy. 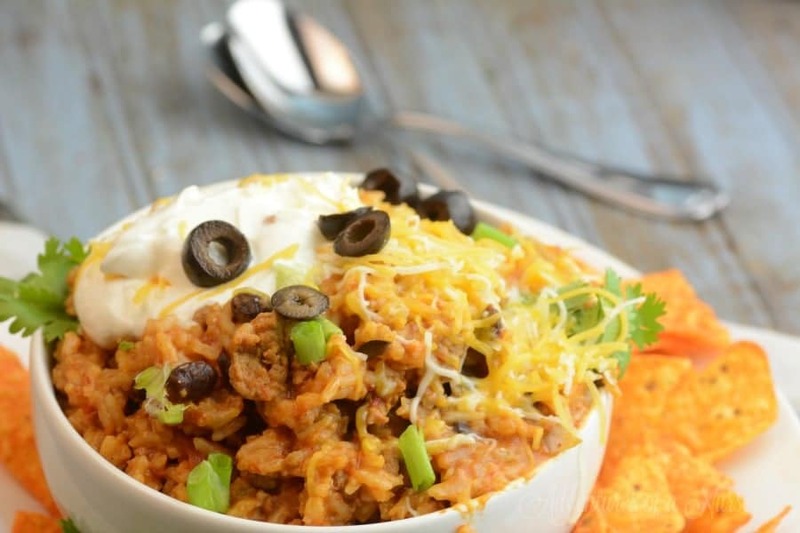 We love this spicy taco bowl!!! I didn’t have any ground turkey, so I used ground chicken and it was so yummy! Loved the taste! Rice wasn’t quiet done but also managed to stick to the pan. I know it’s been almost a year, but I’ve found that soaking the rice first stops that from happening for anyone who’s concerned about it. I made this tonight, but no pressure from pot. Got top off, but rice was semi done and stuck some on button. I continued on with half cheese, stay on warm mode with a lid on. Waiting to see if rice softens up. Got stuck rice off bottom and rice is starting to soften. One question? Does the beans need draining or add the whole can with juices?